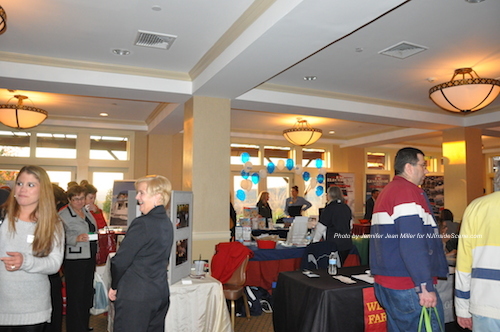 Attendees visiting the various businesses at the Sussex County Chamber of Commerce EXPO. Photo by Jennifer Jean Miller. 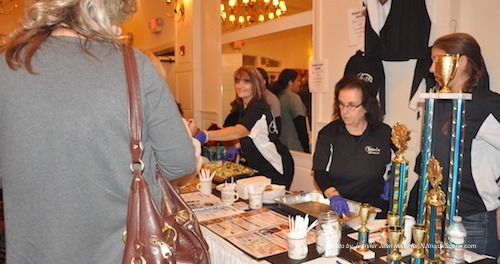 HARDYSTON, NJ – Thousands within the community visited the Crystal Springs Country Club yesterday evening, November 3, for the 2014 Sussex County Chamber of Commerce EXPO. The EXPO was packed with a plethora of businesses and community organizations, totaling more than 100, offering information, items for sale, giveaways, raffles, free samples, and more. Attendees visit with businesses in the lower level. Photo by Jennifer Jean Miller. 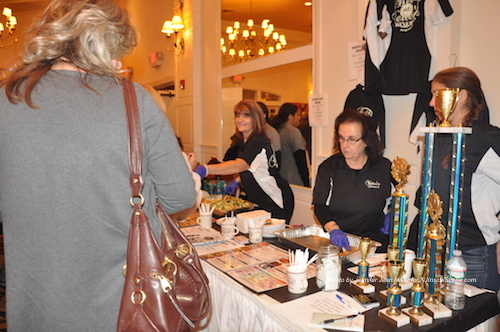 At the annual event, which is free to the public, Crystal Springs features decadent buffet food items for all attendees to enjoy, on both floors of the massive event. The EXPO is the largest annual event for the chamber, and the largest consumer trade show in the county. 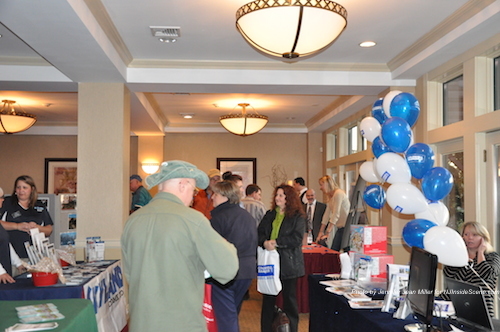 Newton Medical Center was the event’s main sponsor. 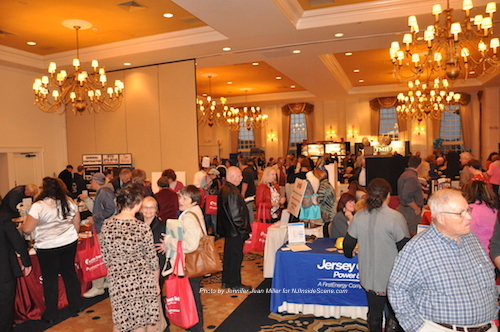 Other sponsors included: Bentley Assisted Living, Compassionate Care Hospice, Eastern Propane Corporation, First Hope Bank, Gruber, Colabella & Liuzza, JCP&L (a First Energy Company), Saint Clare’s Foundation, Skyland’s Stadium, LLC, the Sussex County Chamber of Commerce, The Sussex County Journal, and WSUS 102.3/WNNJ 103.7. 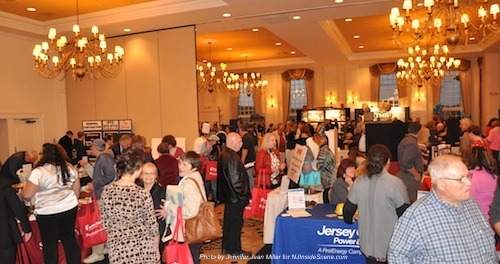 Vendors and attendees within the Emerald Ballroom. Photo by Jennifer Jean Miller. Attendees navigate through the rows of businesses on the lower level of Crystal Springs. Photo by Jennifer Jean Miller. 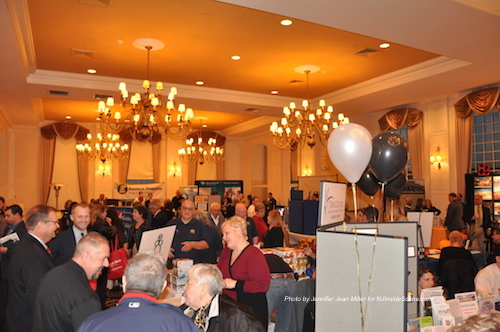 Businesses and organizations at the Expo were: A&D Wireless, Ackerson Pump Company, All County Window Cleaning, Anchor Audio, Andover Subacute and Rehab Center, Animal Hospital of Sussex County, Barn Hill Care Center, Bentley Assisted Living, Berkeley College, T.M> Brennan Contractors, Inc., Brighton USA, Bristol Glen, Business Builders, Cailey Jewelers, Caldwell University, The Cabinet Painter, Caring Touch Home Care,, Center for Prevention and Counseling, Century Masonry & Waterproofing, CenturyLink, The Children’s Therapy Center of North Jersey LLC, Christians for Biblical Equality, Coldwell Banker Residential Brokerage, Comcast Spotlight, Compassionate Care Hospice, Cruise Planners, Division of Child Protection & Permanency, The Doggie Chalet, Domestic Abuse & Sexual Assault Intervention Services, Eagle Home Mortgage, Eastern Propane Corporation, EM Electrical Contractors, LLC, Escape Artist Holidays CruiseOne, Farmside Landscaping and Design, Family Partners of Morris & Sussex Counties, First Hope Bank, From The Heart Elder Care, Garden of Life Massage & Yoga Center, Ginnie’s House, Great Bear Golf Club, The Great Divide Campground LLC, Greater Living Foods, Gruber, Colabella & Liuzza, Heath Village Retirement Community, Highlands State Bank, Holiday Inn Express, Home Furniture Warehouse, Homestead Rehabilitation & Health Care Center, HQW Architects, JCP&L (A First Energy Corp.), Jim Mahon’s Moving & Trucking, Inc., Karen Ann Quinlan Hospice, KG Companies, Kymer’s Camping Resort, Laddey, Clark, & Ryan, Lafayette Federated Church, Lafayette House, Lake Hopatcong Cruises LLC, Lake Mohawk Country Club, Lakeland Bank, Tom Madsen, LLC General Contractor, Mills & DeFilippis, CPA, LLP, Mr. Rooter Plumbing, Newton Medical Center-Atlantic Health, New Sussex Symphony, Newton Theatre, NJ.com, Paragon Village, PathStone Corporation, PB&J Stores, R. Poust Heating & Cooling, Inc., Preferred Care at Home, Project Self Sufficiency, ProPay, R.S. Phillips Steel LLC, Rainbow International of Northern NJ, Rock Island Lake Club, Realty Executives Exceptional Realtors, Residental Home Funding Corp., Saint Clare’s Foundation, SCARC Foundation Inc., Service Electric Cable TV of NJ Inc., The Shawnee Inn & Golf Resort, Skylands Ice World, Skylands Stadium LLC, Spine Surgery Associates & Discovery Square Corners Carpentry, Suburban Morris Water Conditioning, Sunshine Carpet Cleaning LLC, Sussex Bank, Sussex County Arts & Heritage Council, Sussex County Chamber of Commerce, The Office of the Sussex County Clerk, Sussex County Community College, Sussex County Division of Senior Services, Sussex County Econ. Development Partnership, Sussex County Fairgrounds, The Sussex County Journal, Sussex County Republican Organization, Sussex County Sheriff’s Crime Stoppers Inc, Sussex County Trails Partnership, Sussex Skylands-Tourism, United Way of Northern New Jersey, Valley National Bank, Visiting Angels, Wells Fargo Home Mortgage, The Wooden Duck B&B, WSUS 102.3 FM/WNNJ 103.7 FM, Yetter’s Diner and Sussex County YMCA. Jamie Johnson (left) and Deborah Poust Johnson (right) at the table for R. Poust Inc. and Mr. Rooter (Editor’s Note: Mr. Rooter is an advertiser on NJInsideScene.com). Photo by Jennifer Jean Miler. 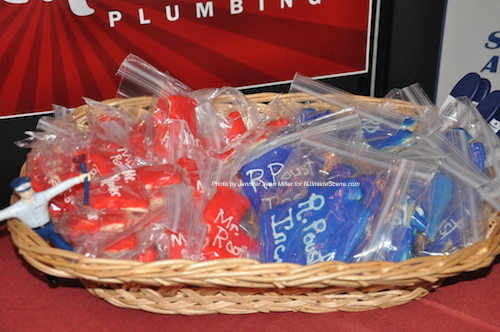 The color coordinated cookies on the R. Poust Inc. and Mr. Rooter Plumbing table were one of the giveaways at the EXPO. 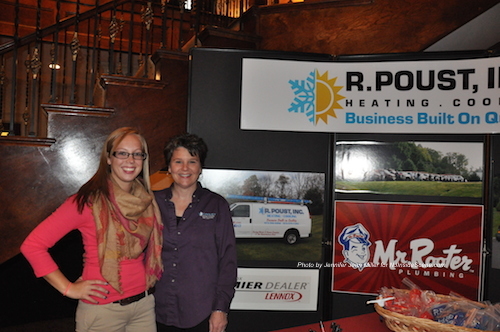 (Editor’s Note: Mr. Rooter Plumbing is an advertiser on NJInsideScene.com). Photo by Jennifer Jean Miller. Representatives from Yetter’s Diner served up Spanakopita (Greek Spinach Pie) and salad with Feta Cheese. Photo by Jennifer Jean Miller. 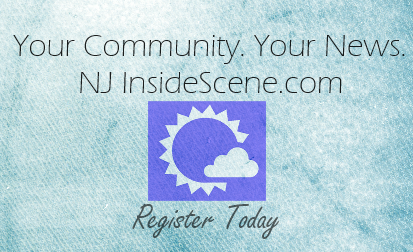 Stay on the scene, with NJInsideScene.com. Click here to follow us on Facebook.